Our “parcel” of Amoureuses covers 52.85 ares (approx. 1.3 acres) and the oldest vines of the vineyard are over 60 years old. The youngest vines were planted in 1966, the majority however were planted between 1954 and 1956. Annual production varies between 900 and 2700 bottles approximately. The name of this particular plot means “the lovers”, which gives birth to all sorts of romantic ideas. Nobody today can really give a convincing reason for the nomenclature of the vineyard. In 1948, however, Camille Rodier stated: « In Burgundy, a wine containing the word amour must be a great aromatic wine; full of fire and sap ». So be it. The soil is primarily made up of a layer of red clay of about 30 to 50 cm in depth lying over a compact limestone “slab” with very little fissuring. The vines however manage to force their roots into this rock with impressive force.. The complexity of the wine gives a clear indication of the nature of the soil. Let’s just say that the name perfectly fits the feminine, brilliant style of this vine. 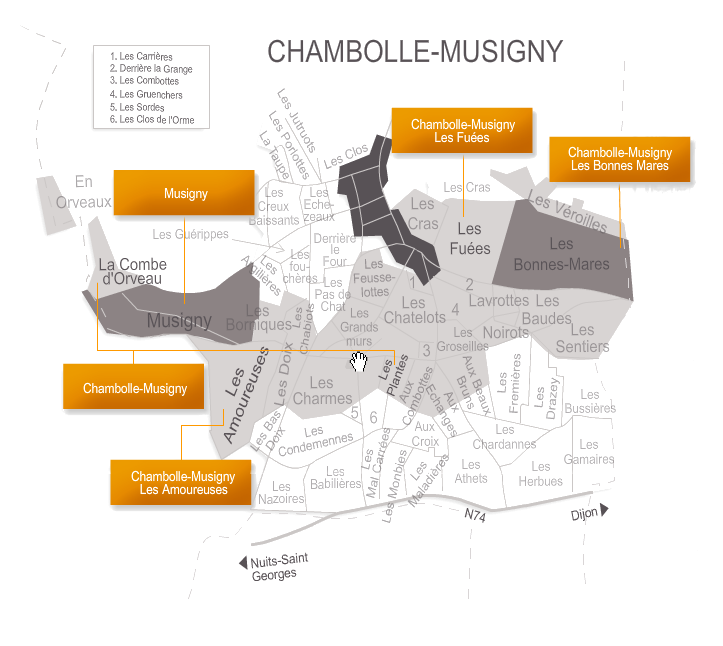 Les Amoureuses, without doubt, is the greatest of the Premiers Crus of Chambolle-Musigny. It can easily measure up to many of the Grand Crus of the Côte d’Or. For us, Les Amoureuses represents the very essence of Burgundy; the most Burgundian of Burgundy wines. No other wine in the world has that paradoxical union of exceptional richness (aromatic intensity, depth of texture and length on the palate) and such airy delicacy. The “nose” is a bouquet of flowers and red berry fruit. Allow this wine at least 7 years to develop. Patient people however will realise that the ageing potential can exceed 5 decades for certain great vintages.